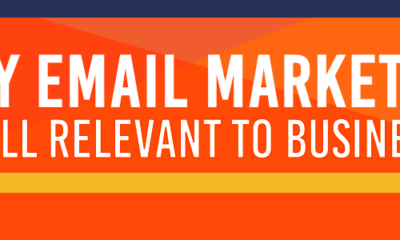 We all want more email subscribers. 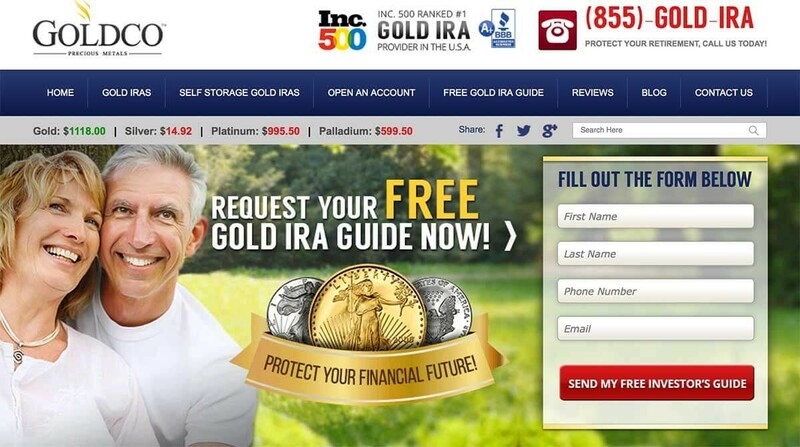 One of the easiest ways to get them is to start at the very beginning – the opt-in form. If you can make even a few positive tweaks to the beginning of your opt-in form process, the results will follow through all the way to the end of the year and improve your email ROI. 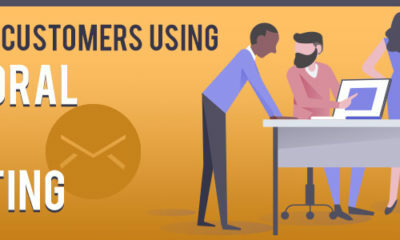 To help you get more opt-ins, we’ve combed the web to find all the case studies and best practices for opt-in forms we could. The roster of opt-in form best practices below is that roundup. All data based, split-tested, and ready to go. Of course, every time we mention best practices, I have to mention that one company’s best practice is not necessarily your own best practice. You’ve got to test. But these should give you some very good testing ideas, and point you toward which test will make the biggest difference in your opt-in form. 1) Give them a reason. 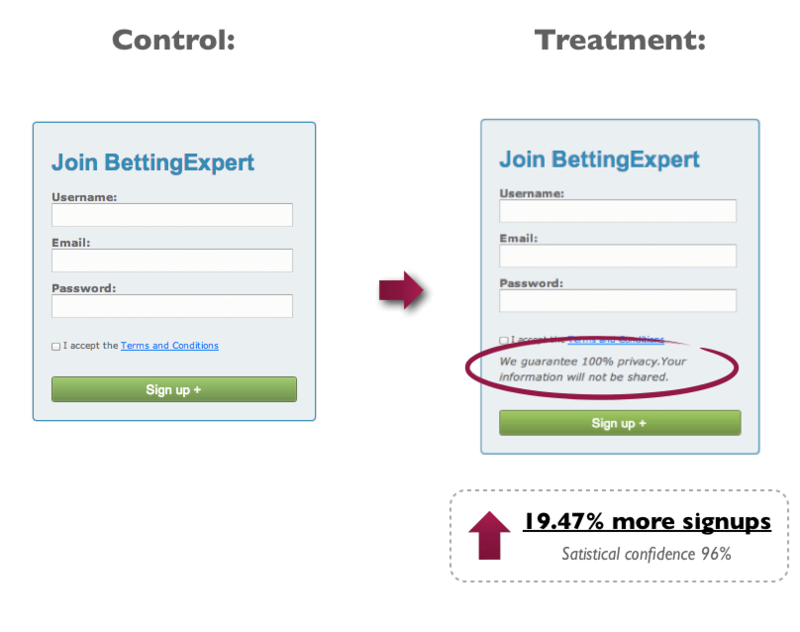 The best way to boost opt-in rates? It’s to offer an incentive. For B2Bers, that’s usually a free report, or maybe access to a white paper or a video series. Online tools are good alternatives too. So are quizzes. 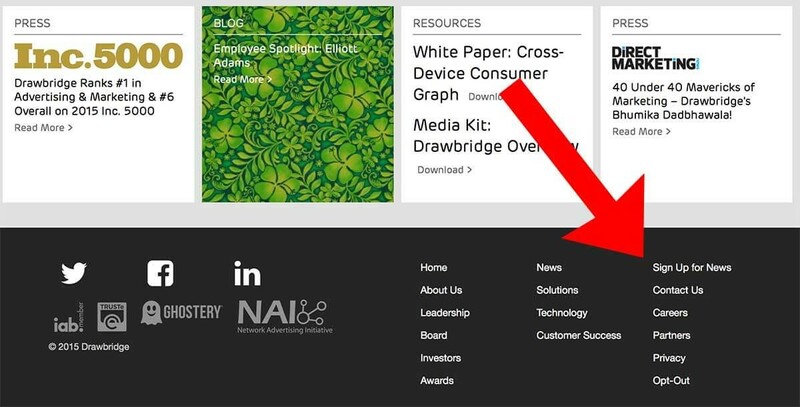 Content downloads include the white papers, free reports and other assets I just mentioned. Website access is a different thing. Ascend2 defines it as “requiring registration to gain access to private or restricted areas within a website”. Because we’re focused on opt-in forms for this post, we’ll lean a bit more toward content downloads, but both of these tactics share a larger strategy: Get the address in exchange for extra-good content, a key practice used in matching your B2B content with your sales funnel. 2) Don’t ask for too much on your opt-in form. 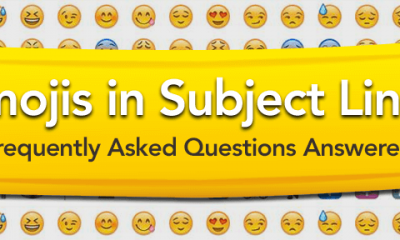 You’ve probably heard about how adding more fields to an opt-in form suppresses opt-ins. Very well – did you hear how every field you add reduces opt-ins by 11%? 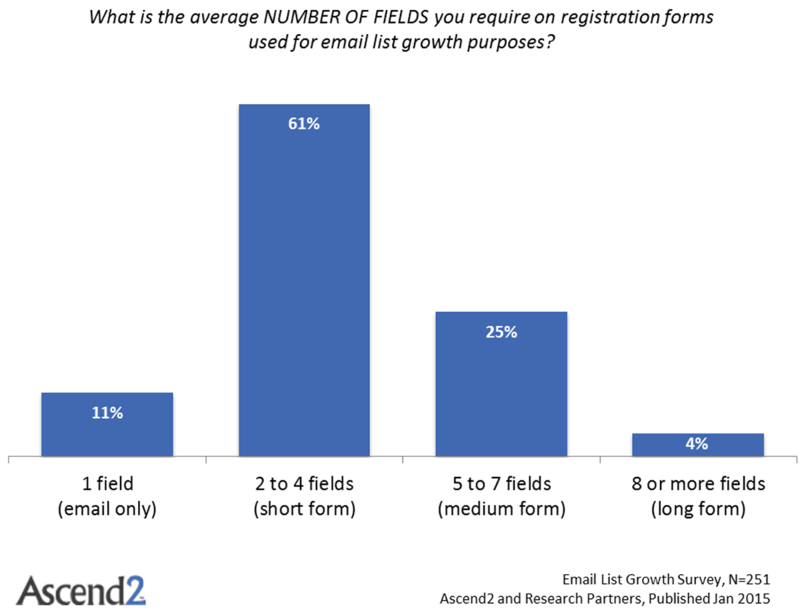 The below image shows you how many fields other marketers use on their forms – it's from the 2015 Ascend2 Email List Growth Survey. This survey was offered to a mostly B2B audience – 71% of survey respondents identified themselves as B2B marketers. After an email address, the most common piece of information to ask for is someone’s first name. Having a first name allows you to put it into subject lines, which has been shown to increase email open rates. It also means you can put their name into the body of the email as a salutation. This is a nice thing to be able to do and most email service providers – Pinpointe included – make it easy to add a person’s name to your emails. How you choose to resolve this completely depends on what your business goals are. Maybe you just want to build your list super-fast, and so you’ll take just the email address and worry about getting more information later. Or maybe you’ll want to get even more information that the long form above asks for. To add fields to your opt-in form in addition to the required email address, just check the checkboxes in the “* Contact Lists/Custom Fields” panel (where the arrow points to). You can add fields like first name, last name, zip code and more. You can also add a select to the opt-in form so people can choose different lists. So if you had, say, a B2C version of your emails, and a B2B version of your emails, you could add that option to your opt-in form. 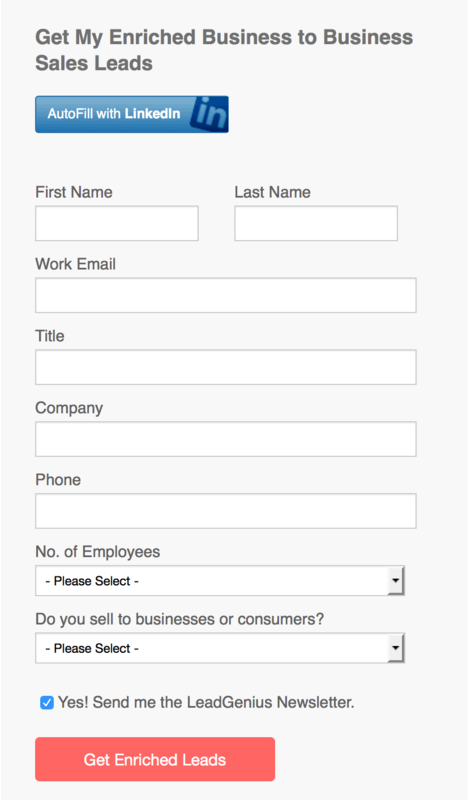 For this example, I kept my opt-in form pretty simple. I added first and last name in addition to the email field. Looks good. I’ll go back to the form edit page and click “Next”. Now I see the page where I can define what I want people to see after they’ve filled out the opt-in form. That includes the first confirmation message on the screen, then the confirmation email (I’m using double opt-in, of course) and then the final confirmation email. Your poor site visitors. They just want to sign up for your email list. They like your company and want to keep tabs on it. 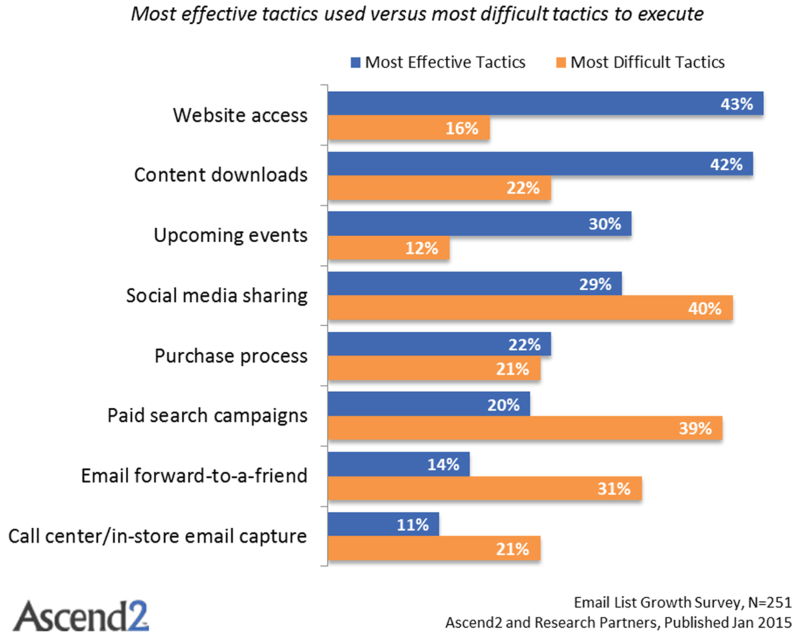 Email is their preferred channel, not social media. So they go to your site but see no opt-in form. There’s nothing in the header about it. Nothing in the footer. They go the blog, but there’s no opt-in form there either. Not in the right-hand column, not at the close of your blog posts. So they go to your About Us page… with no luck. And so they give up. Yet you say you have an email list. Really? Why are you hiding it? 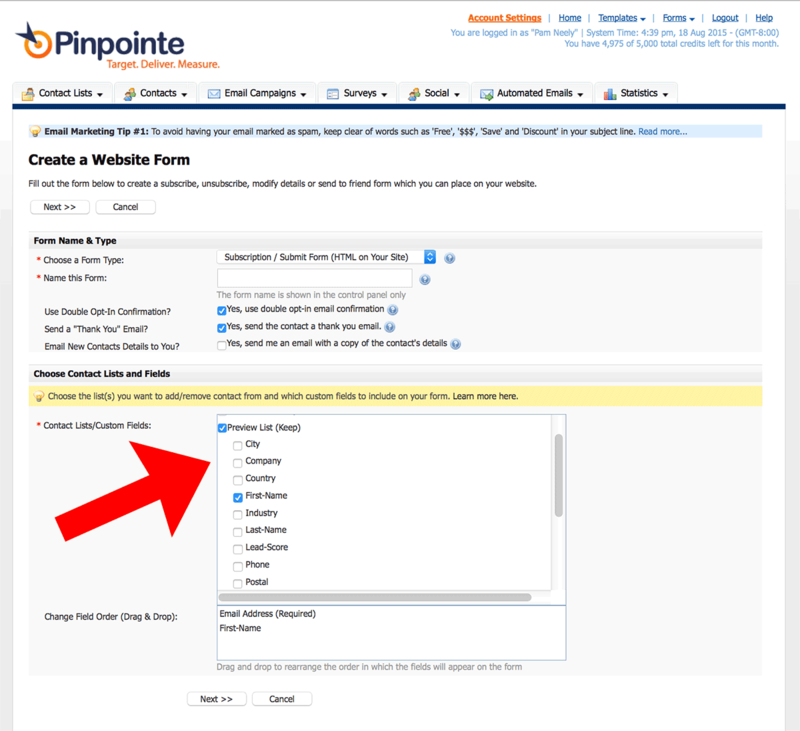 4) Use a feature box for your opt-in form. 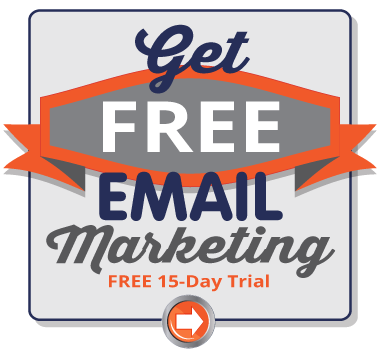 This is one of the big kahunas for boosting email opt-ins. Yes, you are putting it on the most valuable real estate of your site: On the home page, above the scroll line, across the entire screen. But do it, and do it right, and you’ll get half or more of your subscribers from that one opt-in box. I’ve seen these triple opt-in rates overnight. Here’s an example of a feature box that’s also an online assessment. Offering assessments can be a great way to increase people’s interest. New subscribers will get customized information (‘cause they know they’re special), and you’ll have valuable segmentation information. Assessment information can also be helpful to sales staff when they reach out for a follow-up. 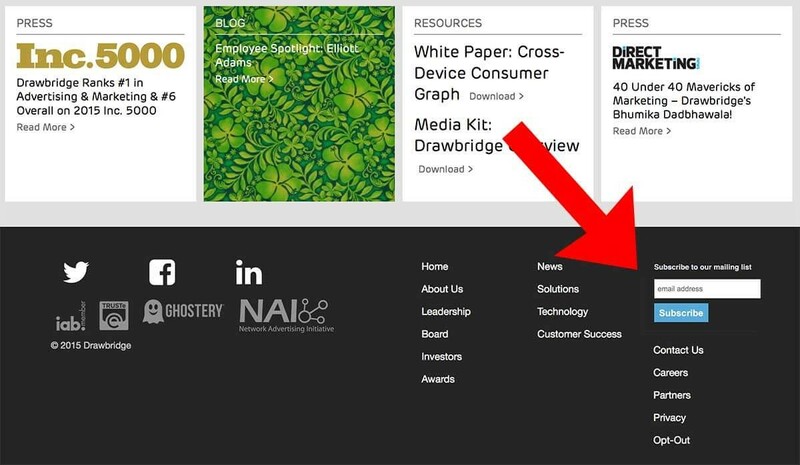 This is the feature box of a digital consultant’s home page. She’s skipped the opt-in form because she’s offering an assessment. Another example of a feature box is the GoldCo home page screenshot from item #1. 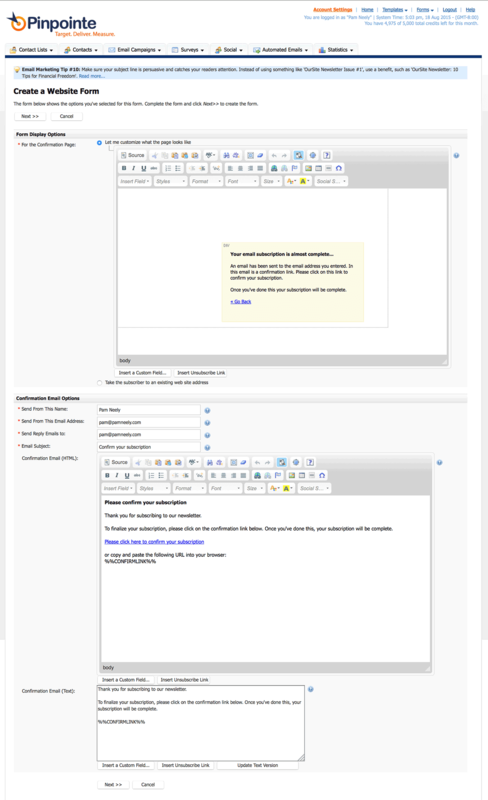 5) Use a form, not a link. When I switch clients from opt-in links (like the one above) to an opt-in form (like the example below it) I usually see a 20-50% increase in opt-in rate. Why does this happen? People are resistant to clicking through. Having the form right there makes sign up look easier. And so they sign up more often. 6) Tell them what to expect. All this influences how many signs up you get, but more importantly, it influences who signs up for your list. The end goal here is not a massive, bloated list of people who aren’t your ideal clients. It’s to have a responsive, engaged audience of ideal subscribers. 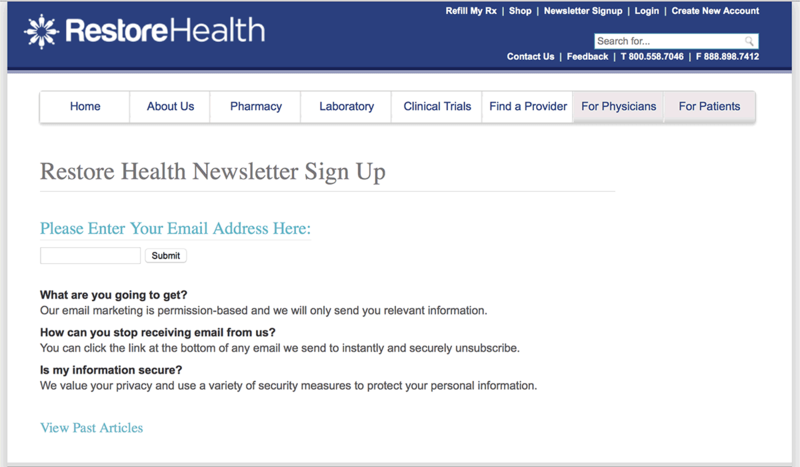 RestoreHealth does a good job of this on their email opt-in page. Ideally I’d like this to be in the footer of their site as an opt-in form, but clearly they’d have to trim the copy. Notice that link at the bottom: “View Past Articles”. 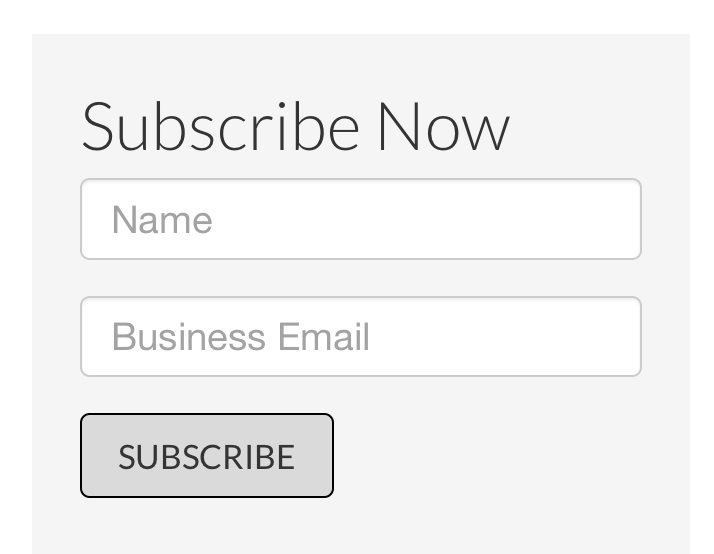 7) Say something more enticing than “subscribe” on the opt-in form button. “Subscribe” is pretty boring. Given how extremely valuable the real estate on that button is, let’s try to write something a little more enticing. Even something as mellow as “Sign me up” or “Send me the report” is better. Of course, you’ll have to test. Empire Flippers did a test of their button copy of “Join Us!” versus copy that matched the opt-in’s headline… and got a 33.1% lift. Button copy (also called “the call to action”) is one of my favorite tests to run. 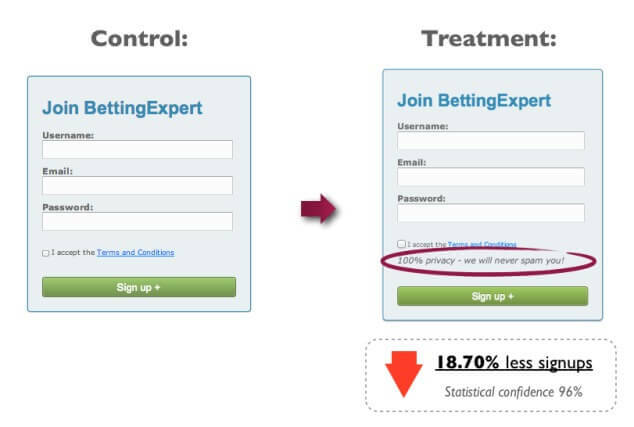 I’ve doubled opt-in rates with button copy tests. You can also test button colors and sizes. Some people think these are kind of wimpy tests to run. I mostly agree with that. 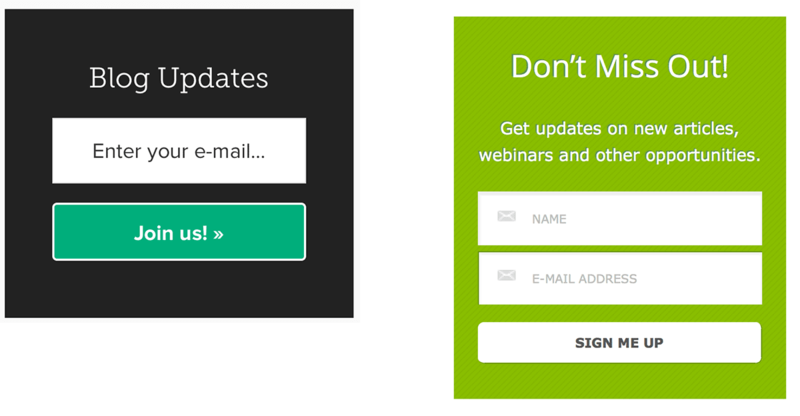 Test more powerful things, like the opt-in incentive, or the form’s placement, or the opt-in headline before you start testing button colors. 8) Offer a sample newsletter, or let them view past issues. RestoreHealth (from #6) has a link at the bottom of their opt-in page for “View Past Articles”. This is not an essential element of an opt-in form, but sometimes it helps. It’s basically the principle of “try before you buy”. Some people like to see what they’re getting before they sign up. 9) Call your updates something more interesting than “newsletter”. The word “newsletter” has associations with being out of date and tedious. It’s a word that’s about as appealing as broccoli (my apologies to broccoli). So don’t use it. Call your email updates “updates”. Or maybe have a name for your email updates, like they were, you know, a publication. Maybe call your newsletter “The Buzz” if you sell coffee products. Or “The Tip” if you’re in the restaurant business. Choosing a name for your updates might be the most fun you’ll have brainstorming in a meeting. Or you could outsource the name-picking job to your social media following and run a contest. While it’s great to come up with a spicy name, it seems like the best word to use instead of “newsletter” is “updates”. 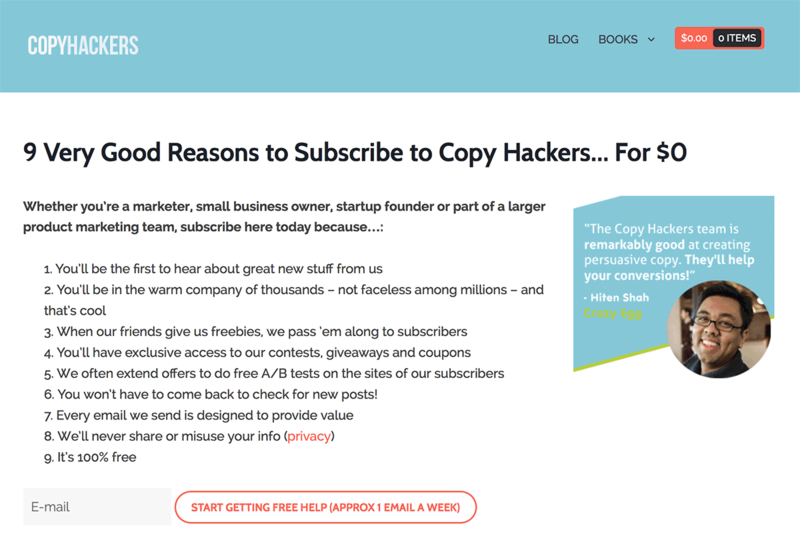 That’s what Copyblogger, CrazyEgg and many other sites (that test A LOT) tend to favor. You could also reframe how people think about your newsletter. Copywriter Joanna Wiebe has taken this to the next level. She refers to her newsletter as “free help” and has gone so far as offering like it was a paid ebook, but for $0. Notice that testimonial over on the right, too. They never hurt. This works for a lot of sites. Whether you say how many subscribers you have, or how many followers you have, it’s all good. Don’t be afraid to include what feels like a small number, either. If you’re in a niche business, saying you’ve got 3,000 subscribers on the opt-in form might still be enough to trigger the social proof benefit. 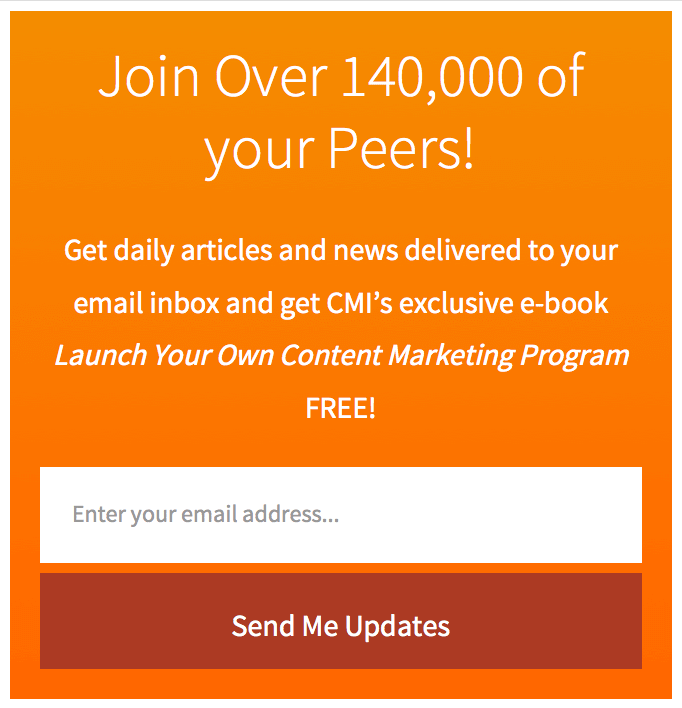 Here’s the opt-in box the Content Marketing Institute uses on their blog. They believe in social proof enough to make it their headline. 11) Add a privacy statement. Then they ran a few more tests, none of which produced a statistically valid result. 12) Add a link to unsubscribe. This often works better than a privacy statement. Including the unsubscribe link so close to the opt-in form proves you actually do make it easy to unsubscribe. 13) Put a default email address in the opt-in form. Prompt people to put their own email address into the form. It makes them just a wee bit more likely to take action. This opt-in box also wins the prize for shortest button copy. For such a small piece of screen space (unless you’ve got a feature box), that’s a lot of do’s and don’t for an opt-in box. Remember that while best practices usually are the… um… best practice, that’s not always so. You’ve got to test, test, test.